Close to a secluded beach - the beach is just short walk from the property. Beautiful view of Malpeque Bay. The Main House has air conditioning. The Carriage House does not have AC. We had 16 family members between the two houses and managed to squeeze everyone in. Lovely grounds to be sure. The houses have a lot of wear and tear due to their age but the superintendent, Richard, was there when we had issues and it all worked. The property easily accommodated our mini family reunion made up of 8 adults, and 8 grandchildren ages 6 to 17. There was lots of room inside and especially outside for playing soccer, softball etc. All smiles ,lighthearted and well rested with few distraction but to enjoy the beauty. We had a wonderful family reunion of 3 generations this past July. Our grand children had so much fun exploring the vast outdoors picking cherries , flowers and running through the apple orchard. One highlight was the walk down the lane to the beach. We rented both houses and found them very comfortable. It's a large house with extra option of the carriagehouse, the owners and property manager were very kind and understanding to clarify any misunderstandings. We enjoyed our stay there, it was quite a luxury! Jackie C.Where do you live? We held a family reunion here, 8 adults, 6 kids. A great success! Montgomery House had all the charm of yesteryear while much of it had been lovingly restored. The grounds were such fun for the kids to run around. The fields of sparkling canola we will never forget. Next time we will bring our bikes. Cabot Beach Provincial Park was a beautiful place to walk and swim. Malpeque is about a half hour drive to many other beautiful sites. As soon as we drove back up the driveway, we realized why we were staying here. It was so, so relaxing. And just like the last time we visited the island, 35 years ago. The owners' handyman was very responsive to our needs. A clothesline was a great addition! My extended family rented both the main house and carriage house for a week in July. The accommodations were perfect for our large group. Lots of bedrooms, places to play sports outside, short walk to the water! The house was very well kept and we loved the charm! Everyone we dealt with was very helpful, quick to respond and polite. The location was great for day trips to other locations but still plenty to do at the cottage and in the local area. Hope to go back again some time! The home's most spectacular feature is its tranquil bayside location, with the sea just a few minutes from your front door. The garden and farmer' fields roll down to a quiet walking beach - just a short walk away. The beach is secluded and is on the Bay which promotes warm waters and it is shallow for swimming (safe for children), kayaking and fishing. Located with easy access to Summerside (PEI's second most populous city), Kensington (closest groceries, movie theaters, pubs, pharmacy, etc.) and Cavendish (amazing beaches and all things Anne of Green Gables). Numerous world class golf courses within a short drive as well as excellent dining. Taste the world famous Malpeque Oysters! Kite-boarding - Prince Edward Island's warm, shallow, flat water bays are perfect conditions for beginners and wake style riding while the swell on the North Shore completes your every need in a Kite-boarding destination. Quiet private area, numerous exceptional golf courses within a short drive, Anne of Green Gables property, close to all attractions, deep sea fishing and sport fishing- Big Tuna, beach combing, bird watching, scenic drives, excellent restaurants - enjoy world famous Malpeque oysters, craft shopping and antiquing all nearby. Weekly Rental Only. Houses may be rented separately, please inquiry about the rates. Cancellation Policy: When reserving 50% is due at the time of booking, balances are due 90 days prior to arrival. 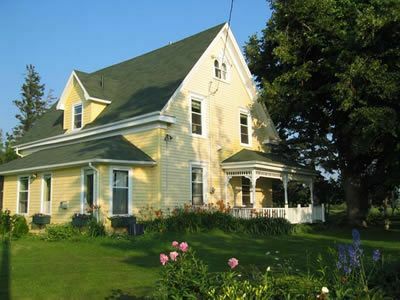 The Guest acknowledges that because of the short rental season on Prince Edward island, they are buying the time available in the houses and they own that time slot. In the event of cancellation after April 1, the deposit is non refundable unless we can rent the property. If we can rent the property we wil refund deposit less $150.00 administration fee.